Ginger has been used since medieval times for both its popular flavor and its medicinal benefits. Find out more about its abundant medicinal and culinary uses. One of the oldest crops to be domesticated by humans, ginger is native to Southeast Asia. Ginger was probably used first for medicinal purposes in China or India, and it eventually arrived in Europe during the 11th century. Nowadays, scientific studies have corroborated the medicinal uses of ginger. The full extent of ginger's health benefits is mainly found in its active compounds. They have been shown to inhibit contractions in the digestive system and to regulate peristalsis. In addition, ginger blocks the absorption of histamine inside the stomach and esophagus, reducing the resulting nausea and diarrhea. Alleviating nausea and motion sickness. The antiemetic properties of ginger helps to control nausea and vomiting. It is also commonly used for morning sickness during pregnancy and for seasickness. Combating gastrointestinal disorders. Ginger works to relieve many gastrointestinal issues, including diarrhea, constipation, and upset stomach. Easing headaches. The anti-inflammatory action of ginger contributes to relieve migraines and headaches. Relieving arthritis pain. Because of its anti-inflammatory properties, ginger can ease arthritis pain. Ginger, high in anti-inflammatory properties, has three main medicinal compounds, all of which are closely-related terpenoids, including gingerols, shogaols, and zingerones. 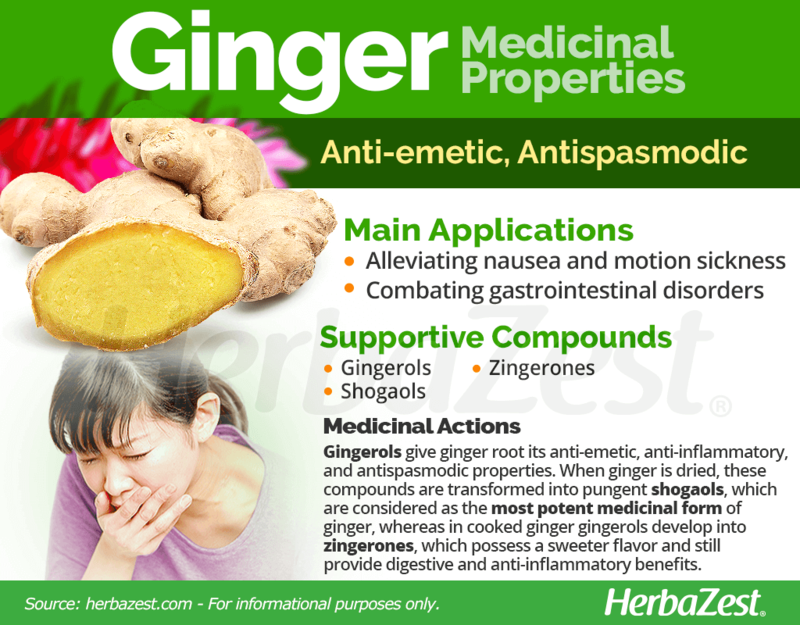 Gingerols, a group of structurally related polyphenolic compounds isolated from ginger, are the bioactive ingredient of ginger root that give it its anti-emetic, anti-inflammatory, and antispasmodic properties. Further studies are necessary to properly understand ginger's mechanism of action; however, some evidence suggests that it can improve the symptoms of Irritable Bowel Syndrome (IBS) by reducing pain and regulating gut motility. When ginger is prepared, gingerols break down into two separate compounds, depending on whether it is dried or it is cooked. When ginger is dried, the gingerols become shogaol compounds, but when it is cooked they are transformed into zingerones. 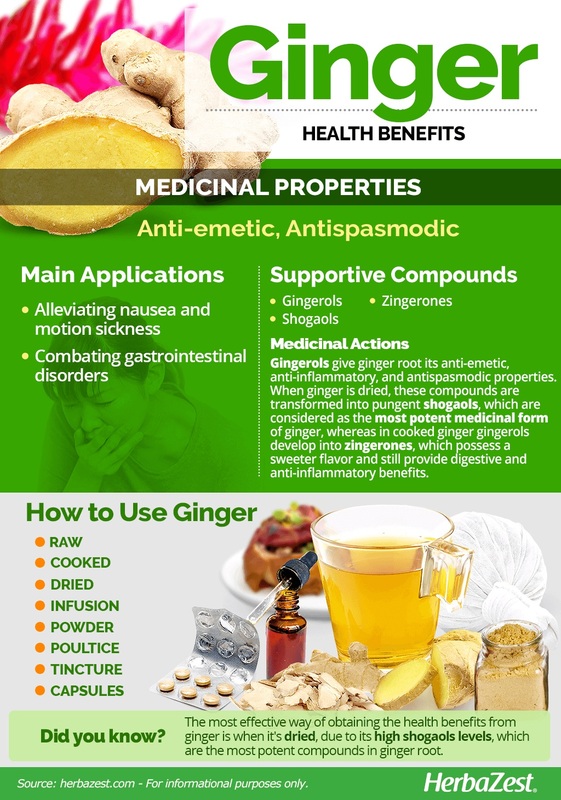 These processes greatly affect ginger's flavor and medical potency. Shogaols are significantly more pungent than zingerones, giving dried ginger a less desirable flavor. However, shogaols are also slightly more potent than zingerones, giving dried ginger a greater medicinal value. Zingerones have a sweeter taste. Other compounds and nutrients in ginger are capsaicin, caffeic acid, curcumin, beta-carotene, and vitamin C.
Gingerols, which are abundant in fresh ginger, are a potent topical anti-inflammatory. Linden and guelder rose also have antispasmodic and digestive properties, while similar anti-inflammatory benefits can be found in witch hazel and turmeric. In moderation, ginger is likely safe for both oral and topical use. However, over-consumption can trigger mild side effects, from gastrointestinal issues (such as heartburn, diarrhea, and upset stomach) to increased menstrual bleeding. When applied topically, ginger may cause skin irritation in sensitive people. Those who are suffering from diabetes or any sort of insulin-related disorder should use caution when consuming ginger, since it is known to lower blood sugar levels while raising insulin levels. Because ginger affects blood sugar levels and slows blood clotting, it should not be consumed two weeks before surgery and those who are on medications to slow blood clotting should limit their ginger intake. Women who are pregnant or breastfeeding should consult a qualified health care professional before taking ginger in medicinal doses, since it may trigger menstrual bleeding. The most effective way of obtaining the health benefits from ginger is when it's dried, due to its high shogaol levels. While shogaol and zingerone, closely-related terpenoid compounds, are both medicinally beneficial, shogaols compounds are more potent than zingerones. Raw. In its purest form, fresh ginger contains gingerols, a compound with numerous medicinal properties, including anti-emetic and anti-inflammatory. Fresh ginger can ease gastrointestinal issues, such as diarrhea and upset stomach, as well as ease headaches and nausea. Cooked . Used in many different recipes, cooked ginger contains zingerones, which can ease headaches and nausea. It also works as an anti-inflammatory and can ease arthritis pain. Dried. 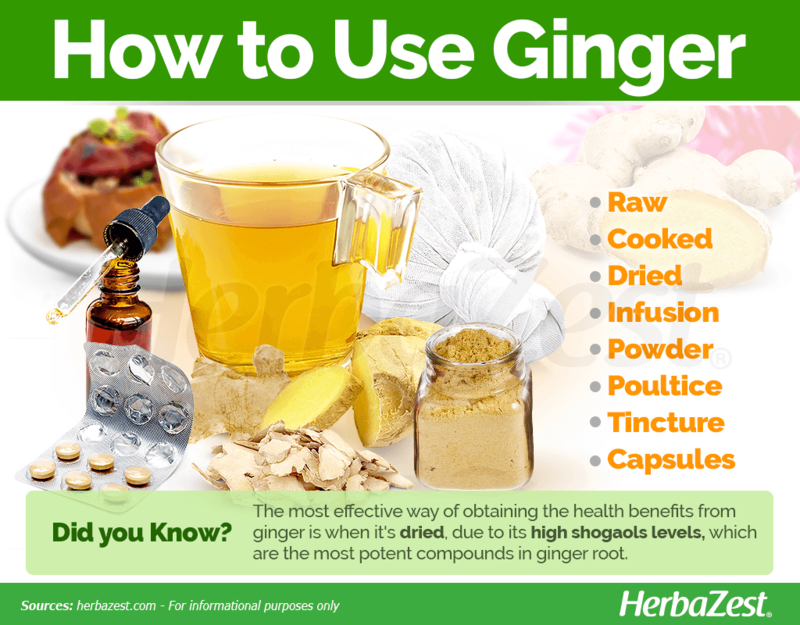 Due to its high shogaol levels, dried ginger is the most potent way of implementing ginger's medicinal value. Dried ginger can relieve many gastrointestinal issues, including diarrhea, constipation, and upset stomach, as well as nausea. Infusion. When taken as an infusion, ginger can soothe many digestive ailments due to its high levels of gingerols. Some of the ailments ginger tea eases include motion sickness, nausea, seasickness, and morning sickness. Powder. Dried and finely ground, ginger root can be used for both culinary and medicinal purposes. This form retains high shogaol levels and can be diluted in beverages for the treatment of motion sickness and stomach discomfort. Poultice. Using crushed ginger or ginger infusion as a warm compress can provide fast relief to painful, tense, aching muscles and joints. Tincture. With similar benefits as infusions, tinctures are a more concentrated, alcohol-based, medicinal form. Ginger tincture should be taken fifteen or more drops at a time in warm glass of water. Capsules. When taken as a supplement, ginger eases nausea and arthritis pain due to its anti-nausea and anti-inflammatory properties. Fortunately, fresh ginger is available year round in most major food markets. Although ginger is most frequently purchased in its fresh state, it can also be bought dry, powdered, and in the form of supplements. Nowadays, both fresh ginger and dried ginger powder are cheap and easy to find around the world. Raw ginger is easy to find in most grocery stores or local markets around the world. The most common presentations of raw ginger include the whole, unpeeled root, which can then be consumed whole or cooked to individual tastes. Dried ginger and ginger powder can also be purchased in most grocery stores and supermarkets, as well a through online retailers. Ginger supplements are mainly found in specialized health stores. In addition, there is a wide variety of ginger supplements available for purchase online, from pills to ginger essential oil. Each brand of ginger supplement may come with different concentrations, although they are overwhelmingly more common in tablet form. Ginger cultivation requires some very specific conditions. It needs a temperature ranging from 72 - 82°F (22 - 28°C) and a permeable, sandy soil, as well as moderate steepness in order to promote good drainage. Ginger normally grows up to four feet (1 m) tall, on the mountain slopes of tropical rainforests. The best season for planting ginger is late winter and early spring. Special care is needed when selecting a rhizome for planting: make sure it's perfectly healthy and has greenish tips or buds. Ideally, it should be 4 - 5 inches (10 - 13 cm) long. Some growers recommend soaking the rhizome in purified water for at least 10 hours. If planting from seed, each ginger seed should be spaced 3 feet (90 cm) apart, in rows one foot (30 cm) from each other. Because of its tropical origin, ginger requires large amounts of fertilizing, with plenty of nitrogen, phosphorus, and potash. Although ginger requires plenty of water, it's important to make sure the soil drains properly to avoid root rot. More detailed information about growing ginger can be found in the herb garden section. Ginger shoots (pseudostems) arise annually from buds on the rhizome. They can grow up to four feet (1.2 m) tall and are formed from a series of leaf bases wrapped tightly around each other with long and narrow mid-green leaf blades arranged alternately. Ginger flowers are pale yellow with a purplish lip that has yellowish dots and striations. Flowering stems are rarely, if ever, produced in cultivated plants. Ginger has a distinctive thickened, branched rhizome (underground stem) which sometimes looks somewhat like a swollen hand, and has a brown cork-like outer layer, and a pale yellow center with a spicy lemon-like scent. The genus Zingiber includes what is known as the "true gingers," with more than 140 species of ginger containing culinary and medicinal value. 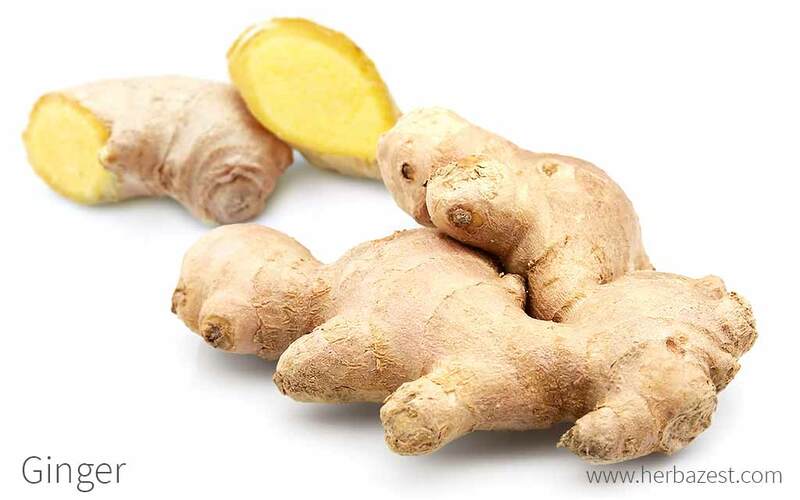 While there are no identified subspecies of Zingiber officinale, ginger has rich cultivar diversity. Several cultivars of ginger are grown in India and they are generally named after the localities where they are grown. They differ in their concentration of raw fiber, essential oils, gingerol, and shogaol. Ginger was an incredibly popular herb in many cultures, including ancient Rome. When the Roman Empire fell, the price of ginger vastly increased and was considered one of the most expensive herbs. Although Europeans considered it simply a luxury spice at first, by the 13th century it was already a staple food and an essential on many herbalist's cabinets. in the Middle Ages, one pound (450 g) of ginger was often the same price as one sheep in trade. Ginger is now one of the most important commercially traded crops in the world due to its medicinal and culinary value, with its annual world production surpassing 1.5 million tons. China and India remain the biggest ginger producers, with 20% and 30% of world production, respectively. China and India's production alone equates to over $200 million USD. Ginger is also grown in other tropical areas around the globe. In many cultures, ginger was considered an aphrodisiac. In fact, its aphrodisiac properties have been noted in many forms of literature, including the famous tale Arabia's One Thousand and One Nights. Lip balm. Rubbing minced ginger root onto the lips can keep them soft and hydrated. Exfoliating agent. Mixing ginger and sea salt together in a bowl of water will provide an excellent body scrub and a quick-and-easy foot spa. Cornell University, Pretty in Pink: Grow Edible Ginger!